Cover image courtesy of Glatt. To reach these aims and optimize the production process, it’s necessary to determine the operational parameters that have the greatest impact on the formulation, spray rate and product temperatures, depending on the material. It is known, for instance, that some oil escapes from the granulation zone, along with fluidizing air, so different gas flow management solutions are available to meet specific application needs. In closed cycle mode, it’s possible to reduce the critical partial density ratio of particle to gas. To selectively adjust the oil concentration in the process inlet air, exhaust air recirculation has proven to be an effective method. Immediately, the partial pressure of the oil in the inlet air increases, which influences liquid transport during the encapsulation process. As a result, the reduced partial pressure gradient of the oil — between the particle and the ambient gas — leads to reduced oil loss during granulation  (see Figure 2). REM image of a sliced encapsulated particle. Image courtesy of Glatt. A significant benefit is the reduced amount of contaminated air (atomizing gas, pneumatic filter cleaning) that has to be cleaned prior to exhaust, which also lowers the energy and material input for exhaust air cleaning. Operating a continuous microencapsulation process in closed cycle mode does, however, require an additional step: discharging condensable components. To avoid saturating the process air with solvents that inhibit the drying process, water and other fluids have to be condensed and discharged from the system . Redesigning the entire process means that oil concentrations in the granulator inlet air can be varied, yielding three benefits: better inlet air quality, less humidity and higher oil concentrations. Compared with single-pass gas operations, oil recovery rates are up to 10 percent better. Moreover, the loss of valuable raw materials in the processing air can be reduced by up to 99 percent with an inline condenser . By contrast, the condenser itself is unable to meet the legal limits for volatile organic substances – neither in a single-pass nor a closed cycle system. Hence the need for a specific exhaust air cleaning unit that enables heterogeneous catalysis. As a result, the contaminated exhaust air produced during encapsulation remains up to 50 percent below the legal limit. 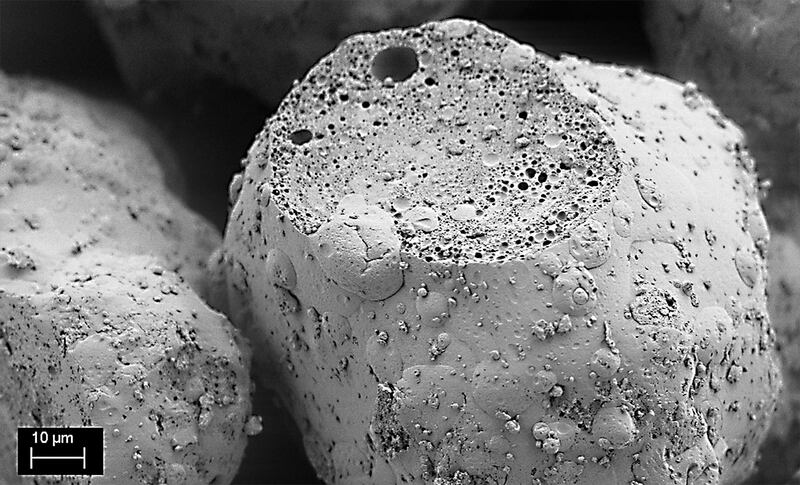 Compared with conventional applied thermal systems, which run at temperatures of 1652 °F (900 °C), a heterogeneous catalysis can operate at only 482 °F (250 °C) — but still offers high quality granulation without needing additional fuel . In conclusion, the energy and material input for exhaust air cleaning is significantly lower because of the known amount of used process gas. In fact, the exhaust air stream is less than 95 percent of the amount of a single-pass one. Finally, closed cycle operation with exhaust air cleaning is a convenient way to comply with legal requirements and, furthermore, delivers cost savings in raw materials, technical equipment and energy input.